The New and Used Audi Parts Specialist for all Audi models worldwide. Audi Part Number: Unknown. It may fit others. Donor Car: 1995 Audi A8 D2 PF 2771cc. Donor Car: 2000 Audi A8 D2 FL 3299cc Quattro. The New and Used Audi Parts Specialist for all Audi models worldwide. Audi Part Number: Unknown. It may fit others. As titled. Removed from a running audi 80 b4 coupe. THIS PART IS FROM AUDI A4 CAH 2010 IN GOOD WORKING ORDER.USED PART MIGHT HAVE SOME USAGE AND STORAGE MARKS. ANY QUESTIONS PLEASE RING POSTAGE FOR SCOTLAND HIGHLANDS AND IRELAND APPLIES. Part Number: 059130089AH. We are breaking a 2009 Audi A5 8T3 / 8T Sport Multitronic (Pre-Facelift). 2.7 (2698cc) V6 TDi A Diesel 190 BHP. Wing Mirror Type. Removed from the car below but may fit other models/years. 2007 AUDI A6 Injection Rail. This item has been removed from a: 2007 AUDI A6. HFIR2524 Fuel Injection Rail. Part Type: Injection Rail. Fuel type: Diesel. Make: AUDI. Year: 2007. Vehicle Colour: Silver. ENGINE - 103kw - CFFB. AUDI A3 8P 08-13 2.0 TDI. AUDI A3 8PA 2012 S LINE. INJECTOR INJECTION LINE. Audi parts available off the shelf. TRANSMISSION MANUAL - NFU. REMOVED FROM VEHICLE CURRENTLY BREAKING COMPLETE CAR. FOR SALE IS A USED BUT GOOD USABLE CONDITION, TESTED AND WORKING GENUINE FUEL INJECTOR COOLING FAN / BLOWER MOTOR TO FIT AN AUDI 100 / 200. PART NUMBER IS 034 959 175. GENUINE AUDI 80 90 100 B4 S6 C4 BOSCH COLD START VALVE INJECTOR. PART NUMBER : 0280170464. AUDI A6 C7 A7 4G 3.0 TDI. REMOVED FROM AUDI A7 4G8 2011 3.0 TDI S LINE CLAA AUTOMATIC GEARBOX MNB LZ7S. FUEL RAIL WITH SENSOR. IF THERE IS A PART YOU ARE LOOKING FOR AND YOU CAN NOT FIND IT. (AUDI A4 Fuel Injector 0000253058. Other Details: Mk1 (B5) 1998 YEAR 1.9 DIESEL 028130201G. This item was removed from a vehicle. Jersey, Guernsey, Scilly Isles) as well as for the Scottish Highlands. 2010-13 Audi A3 2.0 TDI CFF. High Pressure Fuel Rail 03L130089P. Part Number –03L130089P. Engine Code –CFF. We have for sale this High Pressure Fuel Rail from a 2010-13 Audi A3 2.0 TDI. This unit has been removed from a engine with just 45000 miles. PART NUMBER- 079127507AG. 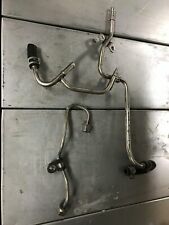 GENUINE AUDI RS4 RS5 4.2 PETROL FUEL RAIL PRESSURE PIPE. FITTED TO AUDI RS5 4.2 PETROL MODEL YEARS. FITTED TO AUDI RS4 4.2 PETROL MODEL YEARS. CENTRE OF ENGINE . ENGINE CODE - CJX. 2.0 TSI FUEL RAIL WITH LOOM. AUDI 2015 S3. VW SEAT SKODA AUDI. REMOVED FROM VEHICLE. This item has been removed from a running vehicle. (AUDI A4 Fuel Injector 0000253059. Other Details: Mk1 (B5) 1998 YEAR 1.9 DIESEL 028130201G. This item was removed from a vehicle. Jersey, Guernsey, Scilly Isles) as well as for the Scottish Highlands. AUDI 80 90 B3 B4 COUPE CABRIO WIRING LOOM HARNESS CABLE INJECTOR FUEL RAIL. AUDI PART NUMBER. : 039133344 / 037971766B. $AUDI TT Mk1 8N 1998-2006 1.8T Fuel Rail 06A133681B - AUM ARY AUDI TT Mk1 8N 1998-2006 1.8T Fuel Rail part number - 06A133681B engine codes - AUM ARY WE SUPPLY GENUINE USED AUDI PARTSWe maintain a clean and safe environment and are fully licensed and regulated by the Environment Agency. Audi parts available off the shelf, and because they are all genuine parts, quality and correct fitment is always guaranteed. Please do not hesitate to email or call us if you have any inquiries Contact numbers- 07807118497 or 07581379600 Please be aware that all items may have usage marks on them in the form of scratches as they are not brand new GLASS AND BODY PANELS WE PREFER LOCAL COLLECTION DUE FRAGILE NATURE BUT WILL POST HOWEVER IT IS DONE SO AT BUYERS RISK. PART NUMBER - 06A906031BA. ENGINE CODE - AUM. AUDI TT Mk1 8N 1998-2006 1.8T. Fuel Injector. (AUDI A4 Fuel Injector 0000253092. Other Details: Mk1 (B5) 1998 YEAR 1.9 DIESEL TESTED 028130201J. This item was removed from a vehicle. Jersey, Guernsey, Scilly Isles) as well as for the Scottish Highlands. (AUDI A4 B7 2006 1.9TDI ESTATE BKE 115BHP. INJECTOR WIRING LOOM. The Warranty is void if any part supplied has been tampered with any way. Head gasket & seals are not covered under the warranty. 4) As a result of insufficient coolant or lubricants. 2015 Audi A5 1.8 TFSI CJE. High Pressure Petrol Fuel Rail 06K133317G. Part Number –06K133317G. Engine Code –CJE. We have for sale this High Pressure Petrol Fuel Rail from a 2015 Audi A5 1.8 TFSI. This unit has been removed from a engine with just 24300 miles. 2013 Audi A7 3.0 V6 TDI Quattro CDU. High Pressure Fuel Rail Left Bank. Engine Code –CDU. We have for sale this Left Bank High Pressure Fuel Rail from a 2013 Audi A7 3.0 V6 TDI Quattro. This unit has been removed from a engine with just 37300 miles. FOR SALE IS A USED BUT GOOD USEABLE CONDITION FUEL INJECTOR RAIL REMOVED FROM A 1995 AUDI 80 V6 CABRIOLET. PART NUMBER IS 078 133 681 K. 01728 685027. AUDI PART NUMBER. : 058133681 / 0280160575. Genuine part Removed from 3 door Audi A3 2004 1.6 Petrol engine. Part also fits:A6 2005 -2012 Mk 3 (C6). the cut off for orders to be processed is 2.00pm. This was removed from a 2003 Audi A4 cabrio 2.4 V6 petrol S line. Fuel type - Petrol. Model - B6. Year - 2003. Power -125kw. FOR SALE IS A USED BUT GOOD USABLE CONDITION COLD START INJECTOR CONNECTING PIECE REMOVED FROM AN AUDI 80 FITTED WITH A 2.0 16V 'ACE' ENGINE. PART NUMBER IS 053 906 175. 06J133317M 06H971627. AUDI A4 B8 S LINE 2009. AUDI A4 B8 SALOON 2009 S-LINE. FUEL RAIL WITH WIRING LOOM. REMOVED FROM VEHICLE We won’t take any responsibility for the compatibility of parts unless we have explicitly said it will fit.